Dov Ganchrow, a designer based in Tel Aviv, has combined the oldest and newest tool-making technologies to produce something extraordinary. He's used a 3-D printer to create precise replicas of the stone flake tools made by paleolithic humans. Then he spruced them up with modern handles and grips. "Flint rocks of desirable size, shape and material quality were sourced from the Negev Desert in southern Israel, while time was spent improving and understanding the skill of knapping," says Ganchrow. "Basically this involved the striking of flint with a softer stone (historically a striking bone or antler was also used) to create controlled breakage, and chipping away flint flakes as the impact's shock wave runs through the stone. Needless to say this is also where the bleeding comes in." 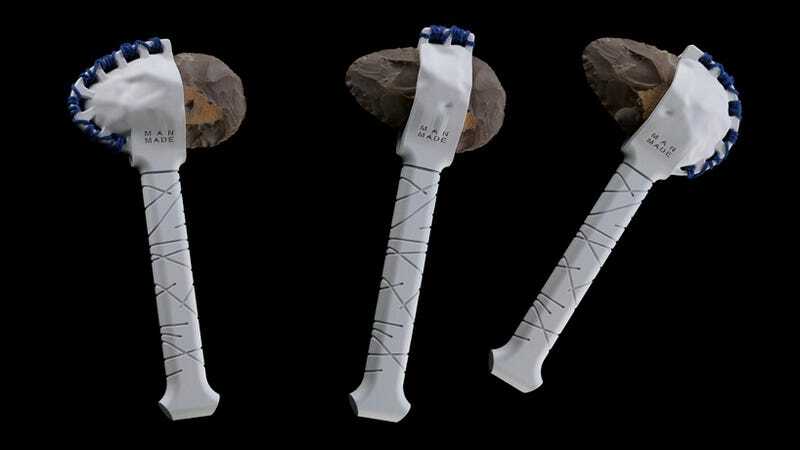 The 3D-printed handles and extensions demonstrate the various gripping and slicing possibilities for the hand axes. Perhaps Ganchrow's next challenge will be designing an appropriate tool kit box.